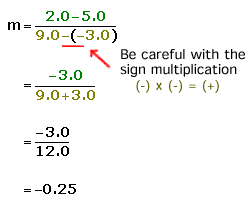 The coordinates of points A and B are (-3.0,5.0) and (9.0,2.0) respectively. Find the slope of the line AB. First, we have to assign (x1,y1) and (x2,y2) with the given coordinates. The slope is equals to -0.25. Clearly, the answer is B.